The event will be May 23-26, 2016, at the annual American Wind Energy Association’s WINDPOWER Conference and Exhibition in New Orleans, Louisiana. Kansas State University is the only school from Kansas and from the Big 12 Conference selected to participate. 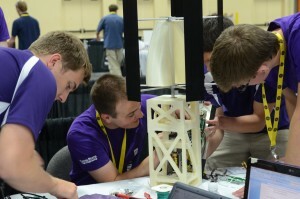 The Kansas State University team’s faculty advisers, Ruth Douglas Miller, associate professor of electrical and computer engineering, and Warren White, associate professor of mechanical and nuclear engineering, think the design experience from the 2014 event and an upcoming competition will further strengthen the team for the 2016 contest. The university’s team will compete at an event April 29-May 1 in Boulder, Colorado, that is a shortened form of the 2014 DOE competition. It involves only those teams from 2014 that wanted to continue design work in the off year between the biennial competitions. “It will be important to have design expertise on hand and also to send members to gain experience for next year,” she said. From Greater Kansas City: Thomas Umscheid, senior in mechanical engineering, Kansas City; Lee Evans, senior in mechanical engineering,Lenexa; Tim Sample, senior in electrical engineering, Olathe; and Aaron Akin, junior in biological systems engineering, Shawnee. Steve Debes, senior in electrical engineering, Hays; Peter Jensen, junior in electrical engineering, Hesston; Tanner Lott, senior in mechanical engineering, Lindsborg; Josh Loyd, senior in electrical engineering, and Shane Smith, senior in mechanical engineering, both from Manhattan; Aaron Mason, junior in mechanical engineering, and David Plenert, senior in electrical engineering, both from McPherson; James Remley, senior in electrical engineering, Miltonvale; Justin Currence, senior in mechanical engineering, Topeka; and Lawryn Edmonds, junior in electrical engineering,Valley Falls. From out of state: Hayden Thull, senior in mechanical engineering,Clarkdale, Arizona; John Annan, senior in mechanical engineering,Orlando, Florida; and Jake Meyer, freshman in electrical engineering,Mound City, Missouri.